When it comes to dental implants, titanium has long been the preferred material to use. In fact, titanium implants have been in use for decades and have been extensively studied during that time. It’s estimated that around 3 million people in the United States have a dental implant, and that number continues to increase each year, according to the American Academy of Implant Dentistry. 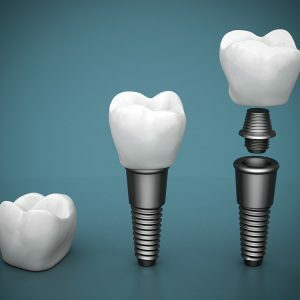 A dental implant is generally made up of three pieces: a screw that acts as the root of the tooth, the replacement tooth (called a crown), and the abutment piece that connects the two pieces. Typically both the screw and abutment are made of titanium while the crown can be made of different materials that look more like your natural teeth. While some other materials have been tried for dental implants, titanium is still the most common for three significant reasons. Titanium is a common choice for dental implants because of its biocompatibility. This means that it works well with the body, generally poses no harmful effects, and the body doesn’t attack it as a foreign object. Over time, the jaw bone will actually grow into the titanium dental implant through a process called osseointegration. Titanium is extremely strong but also lightweight. Because of this, surgeons also use this type of material for hip and knee replacements. The mouth is not someplace you want to add excess weight to the body, so the lightweight nature of titanium makes it a great choice for dental implants. Titanium implants can last for a long time—even up to 30 years or more. And the success rate for titanium implants is around 95%, which means very few patients require a replacement implant unless they somehow damage the implant. Have questions about dental implants? Contact our office to schedule a consultation.